H&M, Hennes & Mauritz, one of the world's largest retailers known for offering fashion-forward apparel and quality basics, is excited to announce the opening of its new Times Square store in the heart of New York City. 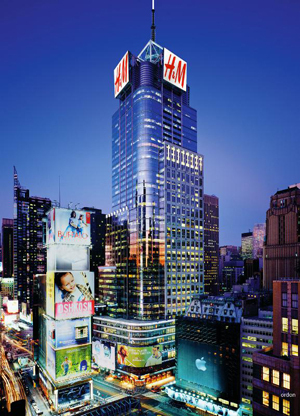 The Swedish retailer will enter this bustling iconic destination on Thursday, November 14th at 12:01 a.m. with a ribbon cutting and lighting of the H&M logo on the top of 4 Times Square by global fashion superstar, Lady Gaga. "This is truly a milestone moment for H&M, to have a footprint at the crossroads of the world and own a piece of the NYC skyline with our brand illuminated on top of this impressive building," says Daniel Kulle, U.S. President for H&M. "With over 7,000 square feet of LED screens, and a 53 foot glitter wall in this ground breaking location, we knew we had to partner with a star who shines as bright as the store." This dynamic store embraces modern technology with a digital runway: a virtual catwalk projecting images of guests onto exterior screens that brighten the backdrop of the city that never sleeps. This unique content can also be accessed in real-time through the customers' social media platforms. The store interior features other digital components such as LED screens, a charging station equipped with iPads, interactive mannequins and much more. Fluorescent fixtures and geometric metal installations further complement the futuristic, tech savvy store design. The approximately 42,000 square foot store will offer collections for ladies, men, young ladies and young men, with separate "shop in shop" areas for accessories, lingerie, sports apparel, maternity and the brand's plus-size line, H&M+. This location will carry the Swedish retailer's fantastic children's collection, which features quality clothing for kids of all ages, from newborn to fourteen years. This will also be the first store worldwide to debut the Isabel Marant for H&M collection to the public. In honor of the launch of Lady Gaga's new album, ARTPOP, H&M Times Square and over 175 stores nationwide will sell her CD for an exclusive price of $9.95 while supplies last. To celebrate opening day, H&M Times Square will be open for 24 hours with a digital countdown announcing hourly offers for the whole family! The first 1,000 shoppers in line will receive an Access to Fashion Pass, valued from $10 to $1,000 and lots of fun give-aways! Twenty lucky winners will receive a golden ticket granting them a "meet and greet" with Lady Gaga and early access into the store to shop.